Man, I love having a Wii again. Not only does it complete my current generation console collection (which does wonders for my OCD), but I get to catch up on a bunch of games that I missed out on. There's the Konami Rebirth series, an official Final Fantasy IV sequel, and oodles of Virtual Console titles that I never got to play when I was a wee little child. Y's Book I & II, anybody? 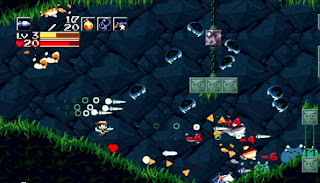 Out of them all, Cave Story was at the top of the list. After dabbling in the freeware version for a bit but hating the keyboard controls, I decided to pick up this spruced up version for the 1000 Nintendo points it was charging and dive right in. 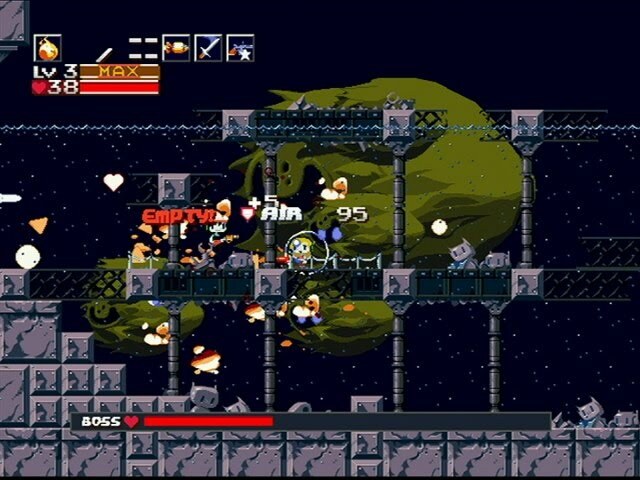 What most attracted me to Cave Story was it's game design. At it's core is a simplified version of the Metroid-Vania concept. Basically, many areas of the game are blocked off until you get the power-up/hit the switch/defeat the boss to gain access to the next chunk of the map. I always get an "a-ha!" moment when I find out how to access the next big area, thus giving me a real sense of accomplishment. Accessing these new areas has also gotten a bit experimental. One of my faves is using the super physics of the machine gun by pointing it to the ground and auto-firing to let my little guy raise up in the air. Control is very tight and accurate for the most part. Your character can run and gun with the best of them. Although it sometimes seems a little too slick when you get near one of the game's many insta-kill pits. Speaking of guns, you'll end up getting quite the arsenal. 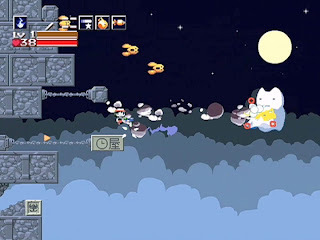 Machine guns, rocket launchers, fire, some odd bubble thing, and a short ranged but hella powerful sword attack will all be at your disposal as you progress forward. Plus, each of these weapons is upgradeable via EX points that the enemies drop. No having to go into an extra menu to do it too, just whatever gun you have equipped gets the juice. You may want to watch how much damage you take though, as each hit degrades your equipped weapon. Nothing you can't fix with a few enemy kills, but it can make the boss fights quite the challenge. So, bottom line: is it worth your purchase of 1000 Nintendo points, aka $10? Yes. The main quest will run 5-6 hours, but there's a few bonuses for those that take a different path through, thus doubling your gaming time. 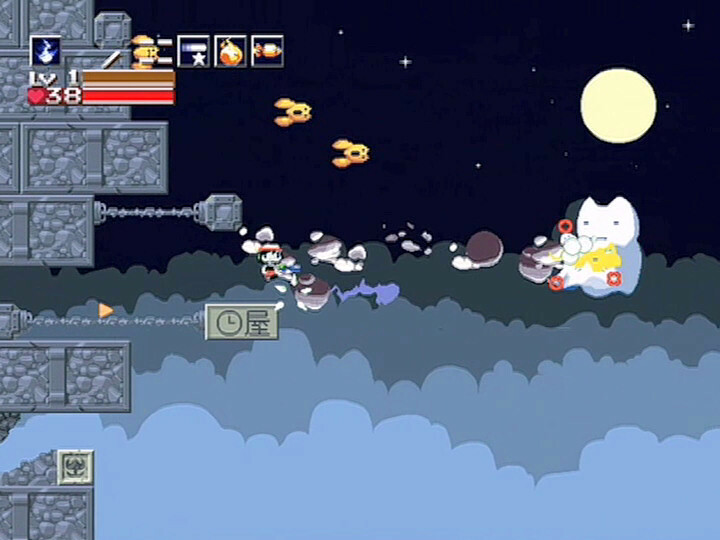 There's also bonus modes aplenty, like a Boss Rush and playing the main game as an alternative character. In the end, your $10 will not go to waste.